Growth and development is an intriguing phenomenon unfolding a sequence of events in a well-organized manner, which are time related. All the systems of a child's body pass through a series of multiple changes during this complex and dynamic process of growth. Dental development is significant among these systems of the child's body. Nutrition has a great impact on children's health. India being a developing country is substantially struck with malnutrition. Malnutrition and underweight are major problems of our country. Of great concern are the underweight children because of the risk of illness and mortality in them. Being overweight can also have long-lasting adverse effect on development of the child. The manifestations in underweight children should be closely monitored because of increased health importance. Trends of manifestations are difficult to quantify and compare as a wide variety of definitions of child underweight are in use. Kumar et al. studied 100 underweight children of age 13–18 years to determine and compare dental age, bone age, and chronological age. Chronological age was determined by knowing the exact birth date, dental age was determined using the Demirjian method, and bone age using hand–wrist radiographs. It was inferred that dental age and bone age gets delayed significantly in underweight children. In literature review, no study has evaluated the effect of body mass index (BMI) of underweight children on dental development, which demands immediate attention in the present scenario. Therefore, the purpose of this study was to determine BMI and dental development in normal and underweight children and to carry out a correlative analysis of calculated dental age, chronological age, and BMI in normal and underweight children of age group of 6–13 years of Navi Mumbai, India. This study was a comparative analysis of dental age, chronological age, and impact of BMI on dental development among children of age group of 6–13 years. To compare the difference between dental age (calculated using Demirjian's method) and chronological age, that is, dental age difference in underweight children (BMI <18.5 Kg/m2) and normal weight children (BMI ≥18.5 Kg/m2). The present study was conducted in the Department of Pedodontics and Preventive Dentistry in Bharati Vidyapeeth Dental College and Hospital. The study was conducted on 301 children of age 6–13 years. Out of these 301 participants, 171 were male and 130 were female, randomly selected from various schools. The study was approved by Institutional Review Board of Bharati Vidyapeeth Deemed University, Pune. In the present study, BMI recommended by the World Health Organization (WHO) for Asian population was used to categorize children in underweight and normal weight, as in the Asian population the mean or median BMI is lower than that observed for non-Asian population. Quetelet's BMI defined as weight (Kg)/height (m2) was calculated for each participant. Participants with calculated BMI <25 Kg/m2. Participants with calculated BMI >25 Kg/m2. After clinical and general examinations, participants were divided into two groups, namely, normal weight and underweight; participants whose BMI falls in between 18.5 and 24.9 Kg/m2 were rated as normal; and participants with BMI was <18.5 Kg/m2 were rated as underweight as per the recommendation of the WHO for Asian population and selected as control group and study group, respectively. Care was taken to ensure equal number of participants in each group. The guardians of the participants were requested to provide the exact date of birth of the participants which were included in the study. Proper written informed consent was obtained from the participants and their guardians. The study was conducted after the ethical approval was obtained from the Institutional Ethics Committee. Chronological age of a patient was calculated by subtracting the birth date from the date on which the radiograph was exposed for that particular patient and was converted into the age of the patient in completed years and months. Patient's dental age was determined using the method described by Demirjian in 1973. The dental age difference of each patient was calculated by subtracting the chronologic age from the calculated dental age. Negative dental age difference indicated delayed dental development and positive dental age difference indicated accelerated dental development. All the data thus obtained were organized, tabulated, and prepared for statistical analysis. All analyzes were done using two-sided tests at alpha 0.05 (95% confidence level). The dental age and chronological age were compared in different age groups using paired t-test. Correlation was done using Pearson's method for correlation between calculated dental age and BMI and between calculated dental age and chronological age. The dental age difference (D) was compared between the underweight children and normal weight children using unpaired t-test for all age groups. 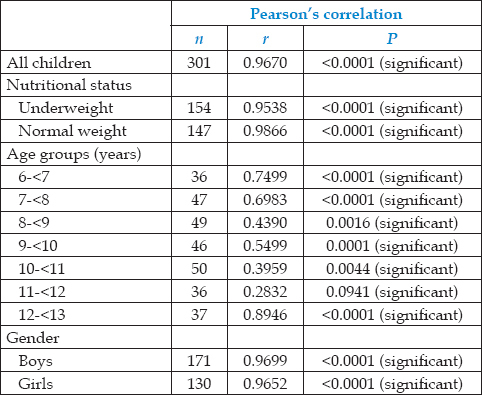 [Table 1] shows the correlation of calculated dental age and BMI in different subgroups in children. Overall, there was a weak positive correlation (r = 0.1739) between the calculated dental age and BMI which was statistically significant (P < 0.0025). 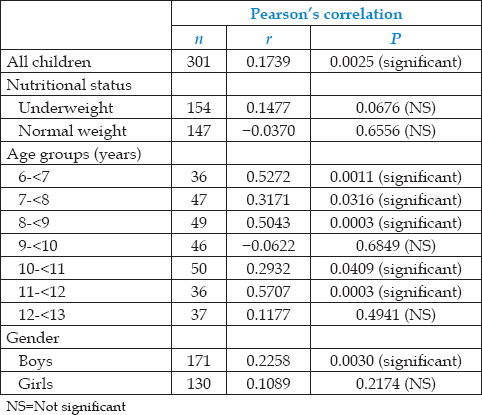 In underweight children, the correlation was weak positive (r = 0.1477), whereas in normal weight children, there was a very weak negative (r = −0.0370) and nonsignificant correlation. In different age groups, the correlation between calculated dental age and BMI was very weak positive, except in age group “9 to < 10 years” where there was a weak negative correlation. There was a strong positive correlation (r = 0.9670) which was statistically significant (P < 0.0001) between chronological age and calculated dental age as observed from [Table 2]. Taking into consideration the nutritional status of various patients, there was a strong positive correlation in underweight (r = 0.9538) and normal weight patients (r = 0.9866) which was statistically significant (P < 0.0001). In various age groups, there was a statistically significant (P < 0.0001) positive correlation between chronological age and calculated dental age except in age group of 10–11 years (0.3959) and 11–12 years (r = 0.2832) where there was a weak positive correlation. Dental age difference (D) is the difference between chronological age and calculated dental age (using Demirjian's method). As observed from [Table 3], the dental age difference in the underweight children and normal weight children is not similar (P < 0.05) for all age groups except “9 to <10 years” (P = 0.191) age group which may be attributed to wide variability in population samples. In all underweight children, the calculated dental age is observed to be less than the chronological age as suggested by the positive value of dental age difference, whereas in normal weight children, the dental age seems to overestimate the chronologic age as suggested by the negative values. This trend was observed across all age groups in our study. Determination of bone age and dental age as opposed to chronological age is important to know the overall maturation of various tissue systems, and it is used in dentistry to formulate treatment plan and acts as an additional source of information in the field of orthopedics, forensics, hematology, pediatrics, and anthropology as well. Dental age is one of the factors taken into consideration when formulating treatment plans for preventive orthodontic treatment such as space maintainers, serial extractions, and growth modulation through myofunctional growth appliances having particular relevance to the timing of the treatment. The timing of intervention while carrying outdental treatments such as growth modulating therapies or serial extractions requires recalculation to consider not only gender and race but also BMI of the patient. The Demirjian method was the most reliable among the different age estimation methods in a study conducted by Hagg and Matsson in 1985 because of high accuracy and precision, especially in the younger age group. In this study, when correlation of calculated dental age and BMI in different subgroups of children was made, it was inferred that overall there was a statistically significant correlation between calculated dental age and BMI. The mean BMI for total underweight participants was 18.06 Kg/m2, which showed that the participants were moderately underweight according to the WHO recommendation of BMI for Asian population, with mean dental age difference of 0.20 years in underweight children with a positive correlation, whereas 0.26 years for normal weight children, which makes it clear that dental age is more than chronological age in normal children by 9.5 days, whereas the chronological age was more than dental age in underweight children by 7.3 days. In total normal individuals, the mean BMI was found to be 19.72 Kg/m2, which showed that the participants were in the lower limit of BMI as given by the WHO for Asian population, for normal weight with a mean dental age difference of 0.32 years. Correlation between BMI and dental age difference was found to be significant which means as BMI decreases, dental age difference increases significantly. Mean dental age difference showed positive difference, that is, 0.32 which reflects the acceleration of dental development as BMI increases in normal individuals. Correlation of positive dental age difference and accelerated dental development in this study was found to be similar with the findings of Hilgers et al. which states that dental development was accelerated in children who had increased BMIs, even after adjusting for gender and age. Significant positive correlation was found between chronological age and dental age, that is, r = 0.2258 for males, r = 0.1089 for females, and r = 0.1739 for total participants. Prabhakar et al. found highly significant correlation between chronological age and estimated dental age (r = 0.5328), which was in accordance with the findings of the present study. This was in agreement and support with Nanda and Chawla and Demirjian, who showed that the dental formation of French Canadian children closely correlated with that of Lucknow (Indian) children. The Demirjian method of age assessment was evaluated by Hegde and Soodin Belgaum children and they concluded that this method of age assessment showed high accuracy when applied to Belgaum children. The present study supports the application of Demirjian method for assessment of dental age in Indian population. The chronological age and dental age showed a significant positive correlation between male and female samples. This is in agreement and support with Cheraskin and Ringdorf, Malagola et al. (1989), Jaeger and Carvalho, and Decarvalho (1991) and Hegde et al. Caution should be exercised when applying the Demirjian method as the relationship between the states of maturity of teeth and other parameters of development varies according to racial groups. The limitation of this study includes cross-sectional nature and the limited number of participants selected from only one locality. Further studies are warranted with extensive and large number of samples to compile the full table of dental age conversion from the maturity score. The formulation of new scoring measures for Indian population requires more studies to be conducted with the application of Demirjian method. The dental age difference was found to be more in underweight children as compared to normal weight children. Along with the chronological age and dental age, the calculated dental age difference must also be taken into consideration. The authors would like to express gratitude to the participants and their parents in the study. Krogman WM. Growth theory and orthodontic practice. Angle Orthod 1940:179-91. Anbiaee N, MohasselAR, Bagherpour A. The relationship between body mass index and dental development by Demirjian's method in 4-15 years old children in Mashdad. J Dent Mater Tech 2013;2:82-5. Thomaz EB, Valença AM. Relationship between childhood underweight and dental crowding in deciduous teething. J Pediatr (Rio J) 2009;85:110-6. Kumar V, Venkataraghavan K, Krishnan R, Patil K, Munoli K, Karthik S, et al. The relationship between dental age, bone age and chronological age in underweight children. J Pharm Bioallied Sci 2013;5:S73-9. Ali B, Sadeghi M. Assessment of dental maturity of children aged 8.5 to 13.5 years using the Demirjian's method in an Iranian population. J Oral Sci 2011;53:37-42. Demirjian A. Evaluation de development Dentaire – Age dentaire - System Demirjian. Universite Montreal:1982. Hilgers KK, Akridge M, Scheetz JP, Kinane DF. Childhood obesity and dental development. Pediatr Dent 2006;28:18-21. Prabhakar AR, Panda AK, Raju S. Applicablity of Demirjian's method of age assessment in children of Davangere. J Indian Soc Pedod Prev Dent 2002;20:54-62. Nanda RS, Chawla TN. Growth and development of dentition in Indian children and development of permanent teeth. Am J Orthod 1966;52:837-43. Cheraskin E, Ringdorf W. Biology of the orthodontic patient: Relationship of chronological and dental age in terms of Vitamin C state. Am J Orthod 1972;42:342-8. Malagola C, Caigiuri FM, Barrato E. Evaluation of dental age using qualitative radiographic analysis. Mondo Ortod 1989; 14:471-5. Jaeger U. Dental age in dependence on the stage of selected physiological developmental parameters. Dtsch Stomatol 1990;40:511-4. Carvalho AA, Decarvalho A. Radiographic study of the development of permanent dentition in Brazilian children with chronologic age of 84 and 131 months. Odontol Rev 1991;19:31-9. Hegde RJ, Khare SS, Saraf TA, Trivedi S, Naidu S. Evaluation of the accuracy of Demirjian method for estimation of dental age among 6-12 years of children in Navi Mumbai: A radiographic study. J Indian Soc Pedod Prev Dent 2015;33:319-23.